It should come as no surprise that the idea for a tropical stout was sprouted in sunny Florida. Recognizing a need in the market, a savvy sales manager encouraged this specific style that was so well-received, the sub-category has now reached breweries like us across the country. You may be asking yourself what exactly defines a tropical stout. Envision a brew that is roasty sweet with distinct fruity notes. Very dark in color, it’s lighter bodied and moderately strong with an ultra-smooth finish. When designing tropical stouts, the intention was for them to be enjoyed all year long. The Beer Judge Certification Program offers a ton of additional information about the sub-category, available here. What is it that makes this sub-category so special, you ask? For one, it’s unlike any other type of stout. While it has some similarities to a sweet stout, it’s significantly more fruity and not nearly as bitter as an imperial stout. When compared to an American stout, it’s not nearly as hoppy. Tropical stouts don’t use normal ale yeast, they are unique in that they use a pseudo lager yeast. In exploring whether to offer this sub-category of stout, rest assured we did our due diligence. The Diamond Knot team kicked off our research with a visit to a number of bottle shops that offer top-notch stout selections, including Norms Market. Once we identified a market need, we headed straight back to our production brewery and taproom and worked hard to develop multiple pilot batches. 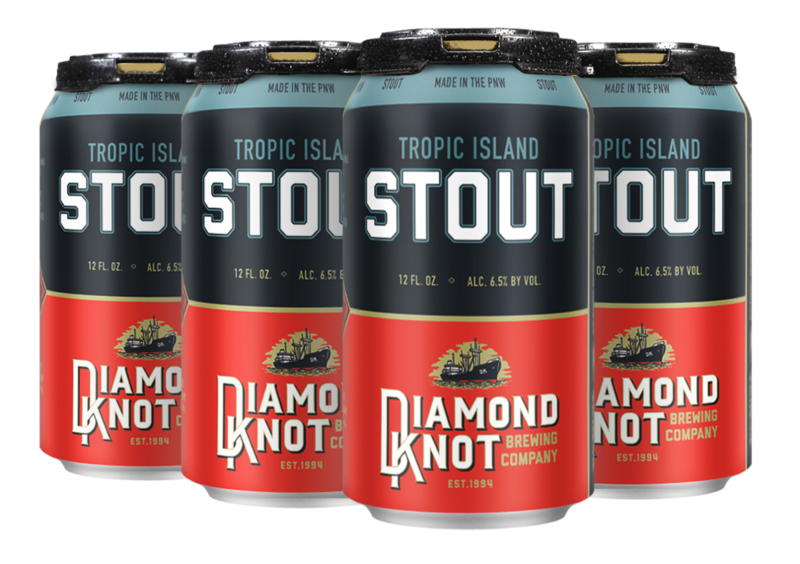 By leveraging valuable feedback from some of our pub friends, we made some modifications that guided us to the existing version of the Diamond Knot Tropic Island Stout. Feautring fruity aromas with smooth undertones of brown sugar, we happen to think this brew is reminiscent of Caribbean rum with smooth, roasted coffee notes. Made with williamette hops and pale, munich, blackprinz and crystal malts, our beer has 35 IBUs and 6% alcohol by volume. Available on draft and in six pack cans, we invite you to give this new Diamond Knot beer a try. If you didn’t already know, we really appreciate any and all feedback provided by our guests so we’re putting it out there explicitly – tell you what you think about this sub-category of stout!